The Phillies have a chance to get back into the win column and even the series with the Marlins on Tuesday night. In that game, they will turn to their $75-million pitcher, Jake Arrieta. Arrieta hasn’t won a game since July 31st, a game against the Boston Red Sox when he went 7 innings, allowed 6 hits, 1 run and struck out 7. His following start, Aug. 6th, he went 8 innings against the Arizona Diamondbacks and allowed 3 hits, no runs and struck out 4. The Phillies went on to lose that game in the 14th inning. Since then, Arrieta has lost three starts in a row and had a no decision in an 8-6 win over the Washington Nationals. He only pitched 3 innings and allowed 4 runs on 4 hits. Needless to say, Arrieta is absolutely due for a win. The Phillies could use a series win as well considering they haven’t won one since the beginning of August, the series following Jake’s quality start against the Arizona Diamondbacks. 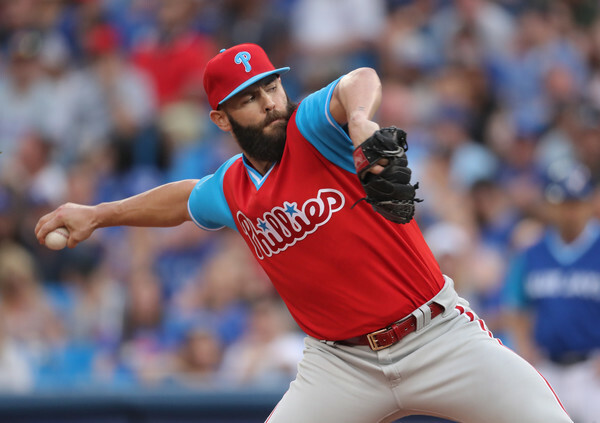 With the Phillies sitting at 72-65, 4 games back of the NL East and 3.5 games out of the wildcard – there is no better time for Arrieta to get back on track and in the win column. Marlins batters have been streaky against the former Cy Young winner. The best hitter against Arrieta is Miguel Rojas, who’s hitting .500 with two RBIs and a homer. Next best is Starlin Castro, who’s hitting .333 with an RBI. Aside from that, J.T. Realmuto, Martin Prado, Derek Dietrich and Brian Anderson are hitting below .290. Magneuris Sierra, Yadiel Rivera, JT Riddle, Bryan Holaday and Lewis Brinson haven’t hit him yet. I don’t want to say Arrieta owns the current Marlins lineup, but the numbers indicate that he performs well against the Marlins. Pair that with the state of the Phillies season and it’s easy to imagine Arrieta turning in a quality start. Pitching well is only half of the battle; the defense must perform and the offense needs to show up for Jake. Lucky for the Phillies, they hit Trevor Richards, the Marlins expected starter, pretty well. Odubel Herrera, Rhys Hoskins, Wilson Ramos and Jorge Alfaro are all hitting over .375 against Richards. Roman Quinn, Asdrubal Cabrera, Justin Bour and Jose Bautista have yet to face Richards. Franco, who may not be available for Tuesday night’s game, is hitting .333. With a deeper than usual Phillies lineup who has success against this Marlins pitcher, I expect the lineup to look something like this: Roman Quinn (RF), Rhys Hoskins (LF), Odubel Herrera (CF), Justin Bour (1B), Asdrubal Cabrera (3B), Jorge Alfaro (C), Scott Kingery (SS), Jake Arrieta (P), Cesar Hernandez (2B). It’s tough to predict what Gabe Kapler will do, but those would be my starting nine in Tuesday night’s game. If Franco doesn’t head to the DL, he should be in the lineup in lieu of Kingery or Hernandez. Tuesday night’s game against the Marlins is what the Phillies are paying Arrieta for. While playoffs hopes are dwindling by the day; the chance is still there. The Phillies are playing meaningful baseball in September and he’s one of the few members of this Phillies team that has been a part of a pennant race. He needs to turn in a quality start for his team. They need him here now more than ever.